Please note: All of the pictures in this post are from Living Crafts Magazine and are used with their permission. Please do not pin any of them since they are not mine. With the money my parents gave me for Christmas I purchased all the back issues of Living Crafts Magazine. This is a great magazine for any crafter, but especially for one who likes to use organic and/or all natural materials. I came across this magazine as I looked into the Waldorf School more and more. In fact a few of the crafts I have done at school have come from this magazine (like this one). The handworks teacher at Hazel's school also subscribes and uses crafts from it all the time. The magazine itself is published four times a year (and I honestly wish it was more because it is so amazing). They do offer digital subscriptions now.And they have an amazing blog to go with it. Oh, and I always love to see what great crafts they find and share on Facebook. Talk about inspiration. The posts they share are not always in English but are always of amazing natural crafts. 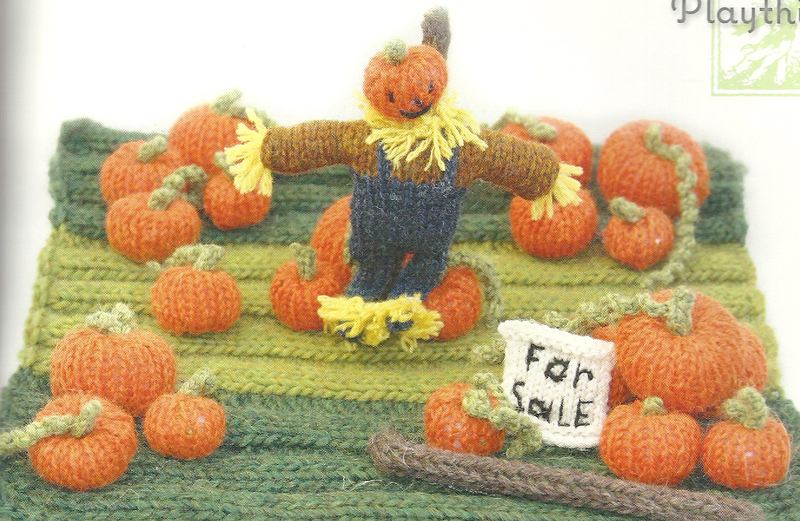 At one of the crafting events I heard about a knitted farm swap that was in their premier issue (as well as the pattern to the angel I linked above). The discussion occurred because one of the mother's at the school actually participated in the swap in the article. It of course got me to thinking how fun it would be to do a swap like this. 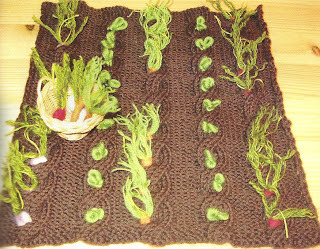 This article is in the premier issue of Living Crafts, Winter 2008. Included in the article are the patterns for all the different squares. In their Winter 2009 magazine they offer five new knitted farm designs. Again these are amazing. They have a pumpkin patch, sheep pasture (including the fence), apple tree with fallen apples, sheep meadow, and a root vegetable patch with removable root vegetables. So I am looking for up to 11 other knitters to join me in this adventure. It will entail knitting 12 12-inch squares of some sort of farmland-either using a pattern from Living Crafts or one of your own. (Note the patterns range from 10-inch by 12-inch rectangles and 10-inch to 12-inch squares, so some adjustments may need to be made.) You will then mail 11 of them to me and once I get them all, I will send you 11 different ones back which you will be able to configure and join to make an amazing farm playmat for your child(ren). I am willing to do this swap internationally, so please do not let that be a factor for you--especially since I know I have some international followers. If you are interested in purchasing the magazines, Living Crafts is offering us a deal of $3.49 plus shipping for each issue. You can purchase both issues for less than you can purchase one on their website! If you are interested in participating please send me an e-mail (craftymomsshare@gmail.com) by Friday, March 9th with your name, blog name if you have one, and mailing address and whether you are interested in purchasing the Living Crafts Winter 2008 and Winter 2009 issues at the special rate. I will then put everyone who is interested in the purchase in touch with the magazine for payment, etc. Then you need to knit your 12 squares and mail 11 of them to me (I'll email you my address when I hear from you) by June 1st (to give everyone time to get the magazines and knit). I will then get the squares out to everyone as soon as I can. I will take the first 11 people and then start a waiting list. If we get 14 or more people, I will send an email to see if people mind knitting more squares than 12 and if we get 24 I'll start another swap. Oh, and if you are joining me, please feel free to grab a button and post it on your blog so we can get more people interested. The more people, the larger your playmat will be! 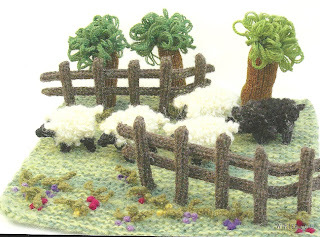 All those who want the Winter 08 and Winter 09 issues with Knitted Farm can have both for price of 1 -- Buy Winter 08 and use Offer Code Winter 09 so you get both! This will be the easiest way for people to buy them and probably the quickest. Thank you to everyone who is already participating and we look forward to having more join us!! So far we have people from four countries, maybe we can add some more. Are you still looking for participants? Kim, your email keeps bouncing on me. Please email me at craftymomsshare at gmail.com. Thanks! Can I join in too? I heard about this from Kelly at Happy Whimsical Hearts. 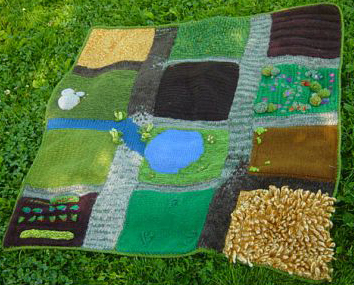 I have subscribed to Living Crafts from the beginning and have wanted to knit the farm mat since I first got the magazine! But it will be more special this way! Just a question, are you going to allocate squares for find out which ones people would like to make, so we do not end up with the same ones? I did a swap like this once and nearly everyone chose the same design!! Yes, Jayne! Just send me an email at craftymomsshare@gmail.com. I just need your email address and where you live right now and will fill you in on all the details. Great idea. 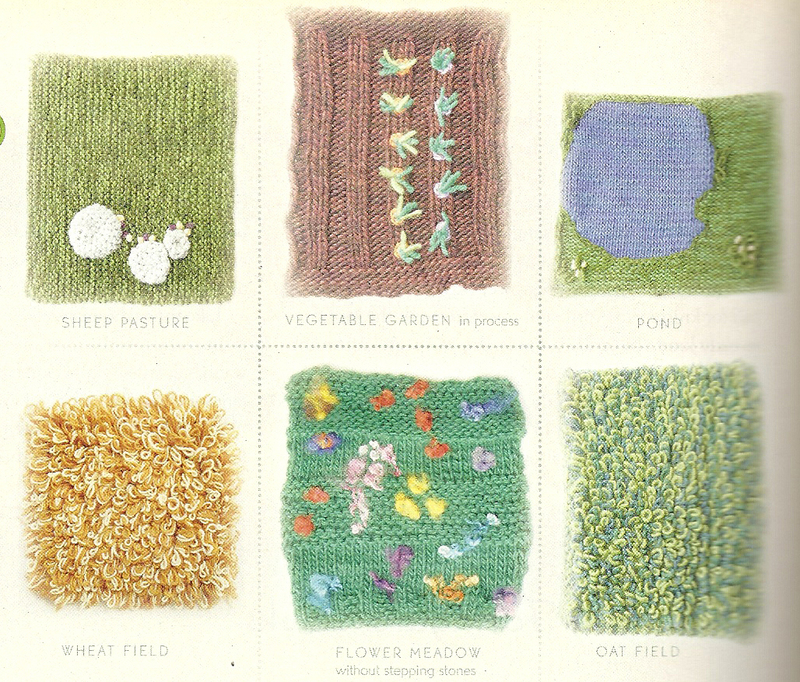 Do you knit with wool? We had an angora rabbit. Fun! Any interest in starting another now that it is 2017? I have 2 mats I need to make. Sorry, LeAnn, we are set with ours. Hazel does still pull it out all the time to play with it though.